On the backdrop of the eviction of Arab families from east Jerusalem and tensions with the United States and the West, a group of some 80 Israeli, Palestinian and foreign activists have embarked on a unique mission to rebuild the houses that were destroyed. The activists, who come each year to a "summer camp" in the Anata neighborhood in the northeast section of Jerusalem, are rebuilding two family homes that were destroyed in an eviction by Israeli authorities during the families' eviction. "Sometimes there are situations in which civilians must rise up against injustice and do the things the government refuses to do," Jeff Halper, director of the Israeli Committee Against House Demolitions, said to Ynet. The activity is not legal, but Halper said that it is vital and important nonetheless: "This isn't just the humanitarian work of helping misfortunate Palestinians. This is an act of political resistance to the occupation. We do it out in the open. If you do it like a thief in the night, it is not a protest," said Halper. Sixty of the 80 activists who came to the summer camp this year are volunteers from abroad, 40 of them from Spain. The Spanish government gives full sponsorship for their participation in the project. "Democracy is not just the right to vote. It is social consciousness and opposition to injustice," explained one of the volunteers. "The Israeli public doesn't really know what is going on here. Everything is done away from the public eye. The Palestinians can't be chased off the land. Even if the government continues to destroy, we will come and rebuild." On a hill facing the construction site, sat Younis Sabiyah, watching his demolished house be rebuilt. Sabiyah has lived in Anta for 16 years together with eight of his family members. Last year, his house was demolished. Since he has been renting. "God willing, I believe the house will be erected and they won't destroy it. The people here are not just friends, they are like brothers and sisters to me," said Sabiyah. The young volunteers received surprising support in a Jerusalem municipal councilman. Meir Margalit (Meretz) came to help the group rebuild. "I am not trying to hide. I am acting openly against the city's policy and building houses it has demolished. It is my deep commitment to humanitarian values," Margalit said to Ynet. "With every house destroyed by the state, it damages the central pillars on which it is based. What I am doing is a desperate attempt to save the country from itself, to dismantle the mechanism of self-destruction that has been in motion in this country since '67. My basic motivation is to try and put the State of Israel back on the path of sanity," explained Margalit. 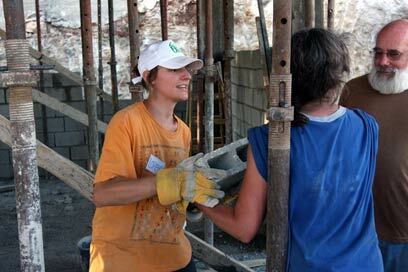 Margalit takes an active part in the rebuilding project and takes part in the building. "The main objective is not just philanthropy. In addition to a house, we are also building a bridge for coexistence. We ultimately will live side by side in independent states, and now we are building the foundation that will help us live in peace," said the councilman. 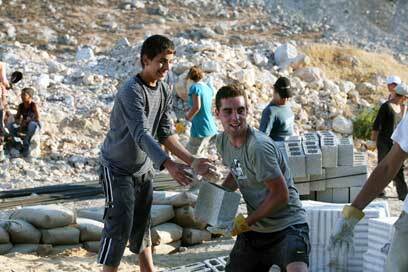 See all talkbacks "Volunteers rebuild houses demolished in Jerusalem"